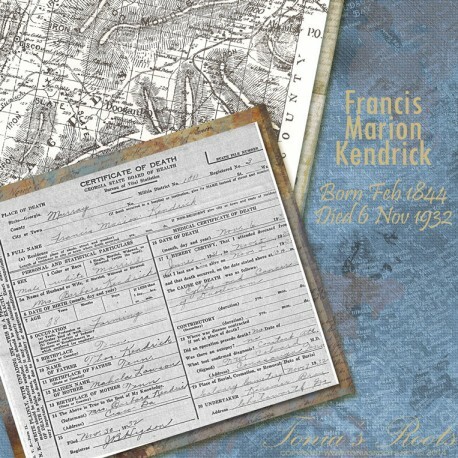 Francis Marion Kendrick, my 2nd great-grandfather, died 6 November 1932 in Militia District 1011, Murray County, Ga., according to his death certificate. 11. BIRTHPLACE OF FATHER Tenn.
What test confirmed diagnosis? Constant att. (Signed) T. W. Colvard, M. D.
The source reviewed is an original record. It is a certified copy of the signed death certificate, which I obtained from the Murray County Probate Court on 31 Dec 2009. The death date and other medical information were provided by the attending physician and would be considered primary. Alaculsey as the place of death is derived from two pieces of data, both of which are also primary: 1) his place of death is recorded as Militia District 1011, which was the “Alaculsey” district in the 1930 census, just two years earlier. Other documents state that he died in Cisco, but that is likely based on Francis’ and Barbara’s mailing address; their mail would have come through the Cisco post office at this time. Birth information was provided by his wife, Barbara, and is considered secondary. His age was reported as 88, which would mean he was born between December 1843 and November 1844. 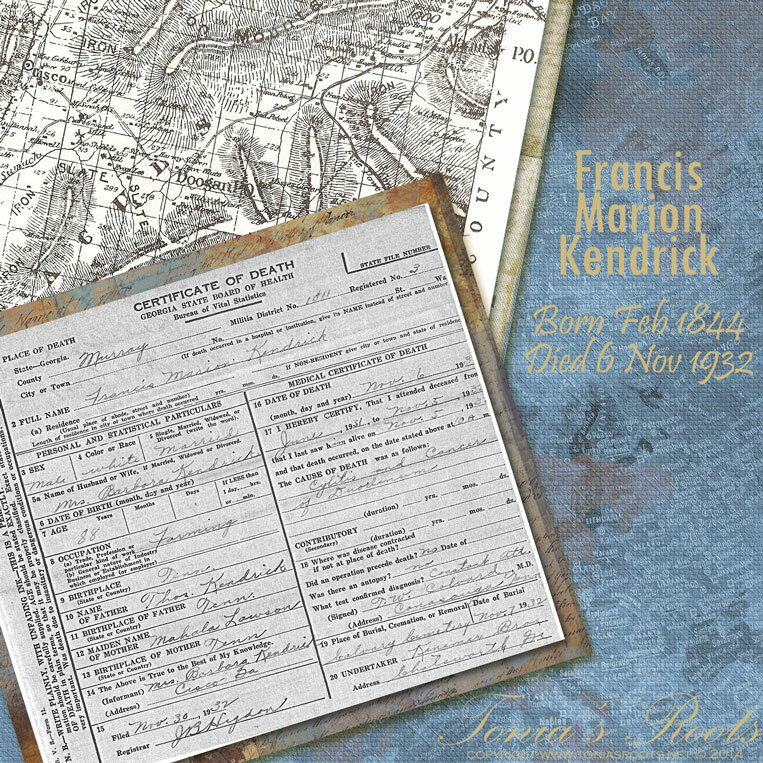 The 1900 census states that he was born Feb 1844, so the death certificate is consistent. 3 All known sources consistently report Tennessee as his birth place. Barbara was the informant on the death certificate. Her address would be primary information. Lastly, regarding the burial information. . .I’m really not sure who would have provided the information. Would it have been Barbara or the funeral home? In either case, it is primary information. On a side note, I was at Dr. Colvard’s house a couple of weeks ago when I did Murray on My Mind. Had I known he was Francis Marion’s physician, I would have taken a picture of the house.